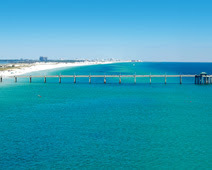 Little Mrs. Married: Okaloosa Island - here we come! I am just now getting extremely excited about our vacation!!! WOOHOO!! So on Friday we are leaving for Okaloosa Island! We usually go to Destin or Pensacola. 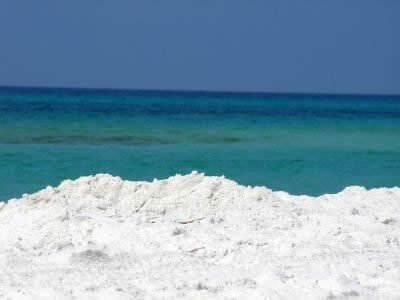 This year we're going to Okaloosa Island. I've never been there. It's just on the other side of Destin, mom said. We'll be staying in a condo - me, brad, mom, dad, michelle & her fiance, mike. All three dogs are coming too! (Lord, help us!) I'm actually not CRAZY about that idea, but we don't kennel our dogs (never have, never will...just can't do it!) & usually when i go out of town, mom keeps Fievel. When Michelle goes out of town, mom keeps Bali. When mom goes out of town, she takes her dog Molly with her. So yeah! We are taking them all with us! I suggested having someone house/dog-sit, but we didn't go with that (i don't remember why now)! Anyway, it'll be fun. It's a 3 bedroom, 3 bathroom condo. It looks nice!!! I cannot WAIT! I have so much to do before our trip!! Seriously... it's gonna be crazy! But i can't wait to leave Friday evening!! I can't wait to wake up on the beach Saturday morning! Your vacation sounds like so much fun! That is awesome about your sister. I've only been to Destin once, but I loved it. It's beautiful, and I'm sure where you're going is just as beautiful! Have a great vacation! Sounds like a blast! I'm glad your sister is getting better! I think I got a little jealous while reading this haha. Have a wonderful trip- you deserve it! The pictures look absolutely gorgeous there! Please stop in Corpus and grab me on the way!!!! You are going to have soo much fun!!! I am so thrilled that your sister is doing so much better-prayers for her!!! Y'all are going to have so much fun!!! !